Every once in a while an occasion comes along where an ordinary sandwich just won’t do. Such an occasion occurred a couple of weeks ago when a friend of mine and I were hosting a “meet and greet” for a woman who is running for School Board Trustee. The invitation said “Wine and Hors d’oeuvres will be served”. We decided to transform ourselves into 1960’s hostesses and serve canapes and crudite. If you’ve ever had a hor d’oeuvre party you know making those delicious critters is more work than Thanksgiving Dinner, but it’s fun project nonetheless, that is if you do it once in a while. Once in a long while! A couple of days before the party I started to worry we didn’t have enough “substantial” food. It’s a problem I have; I like to feed folks. We decided to come up with some sort of a sandwich we could cut up small and skewer with a tooth pick. The thing about small food is it needs to pack a lot of flavor in a single bite. We wanted to be able to make the sandwiches early in the day so things like tomatoes were off the list. And we wanted it to look good without being too frou frou. It wasn’t a tea party after all. 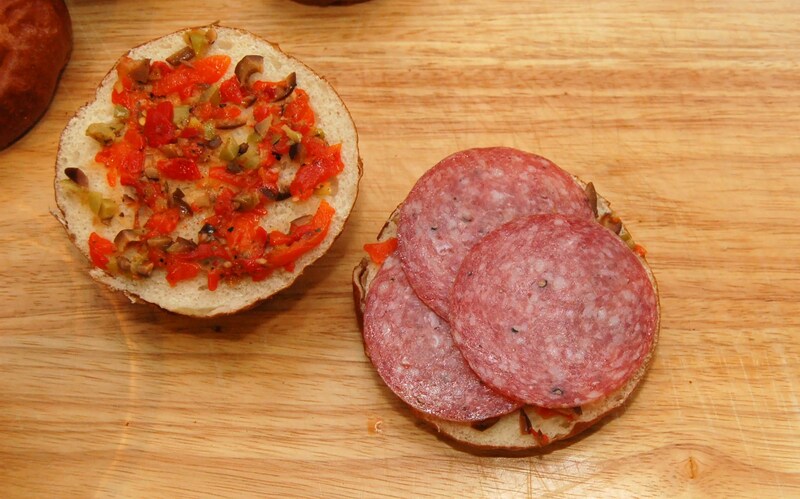 So the turkey, ham, salami, and provolone with olive and sweet red pepper relish was born. 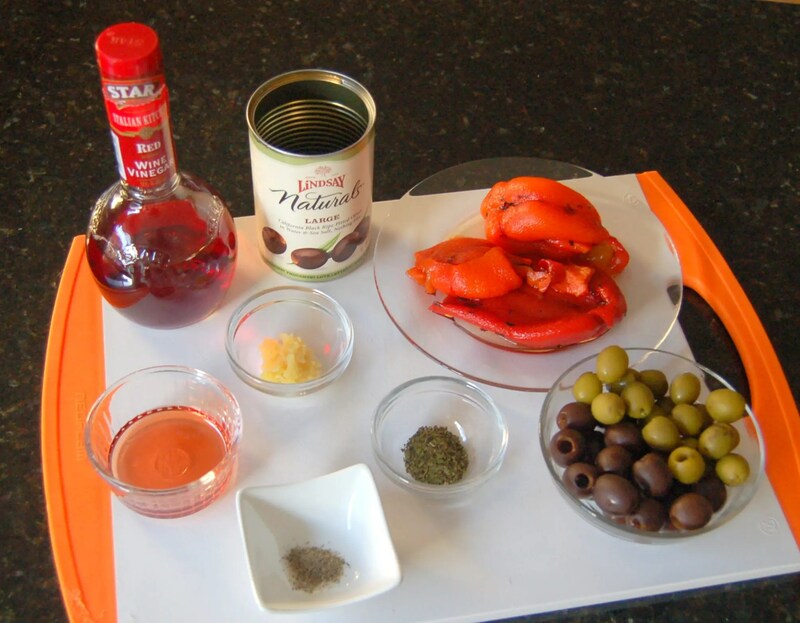 The relish is easy to make with roasted red peppers, olives, red wine vinegar, olive oil, salt, pepper, garlic and oregano. I got my sweet red peppers from a jar but you can also make your own. 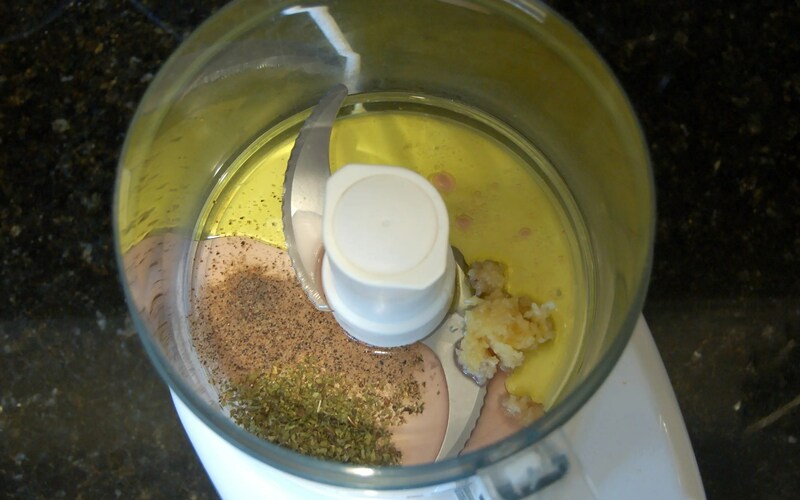 Put the olive oil, garlic, oregano and salt and pepper in a food processor until smooth. If you don’t have a food processor, mince the garlic and whisk in the other ingredients. Add the olives and peppers and pulse a few times until they are coarsely chopped. You can do this without a food processor as well. Just chop everything up. 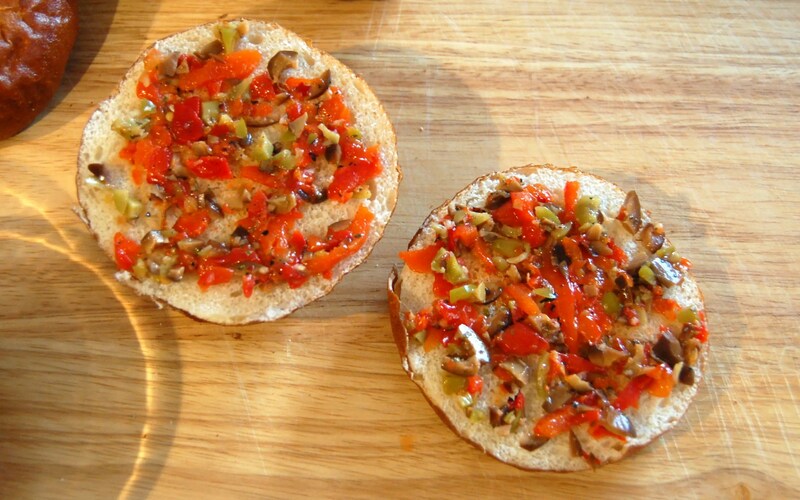 Next spread a little of the olive relish on the top and bottom of the bun. I put a little finely minced red onion on top of the relish then start the layering with the salami. Add the rest of the sliced meat, a slice of cheese then a bit of sun dried tomato. It might not look pretty but it tastes good! Finish the whole works off with some baby arugula. It adds some nice peppery freshness to the sandwich! 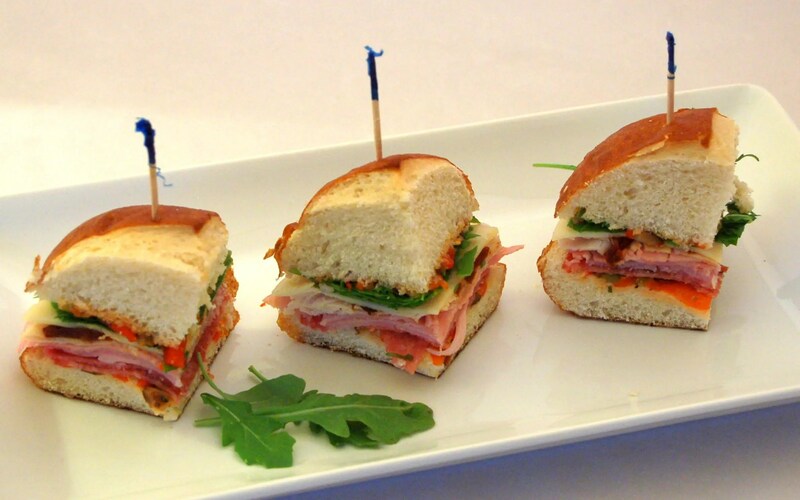 If you’ve got a party going on, quarter the sandwiches and skewer with a toothpick! 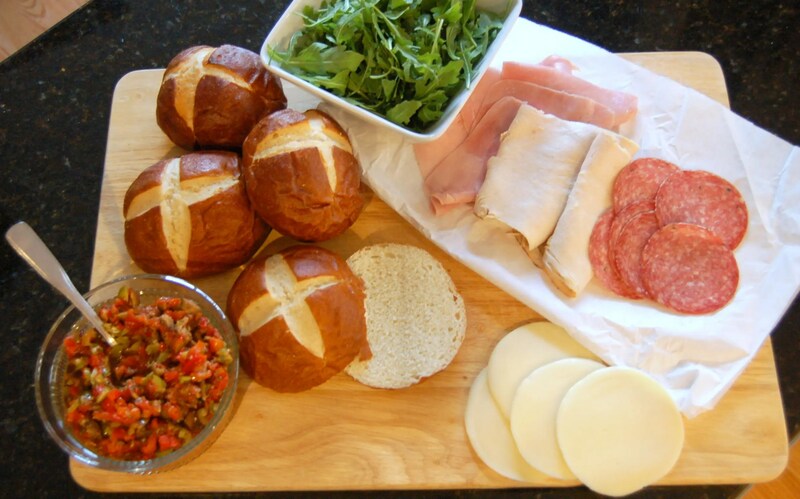 Delicious sandwiches that are easy to make and will keep them coming back for more! 4 dense bread rolls such as pretzel rolls. 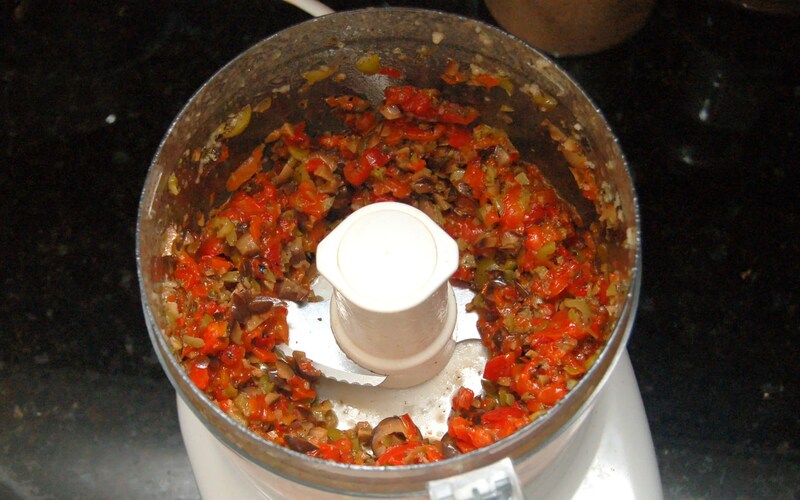 In the bowl of a food processor, add garlic, oregano, pepper, vinegar and olive oil. Process until smooth. Taste then decide if you want to add some salt. I found the olives were salty enough without adding any extra. This mixture will last in the fridge for about a week. I think it's best the second day. If you have left overs toss it in some pasta for a quick and delicious supper. Spread relish on the top and bottom half of the bun. 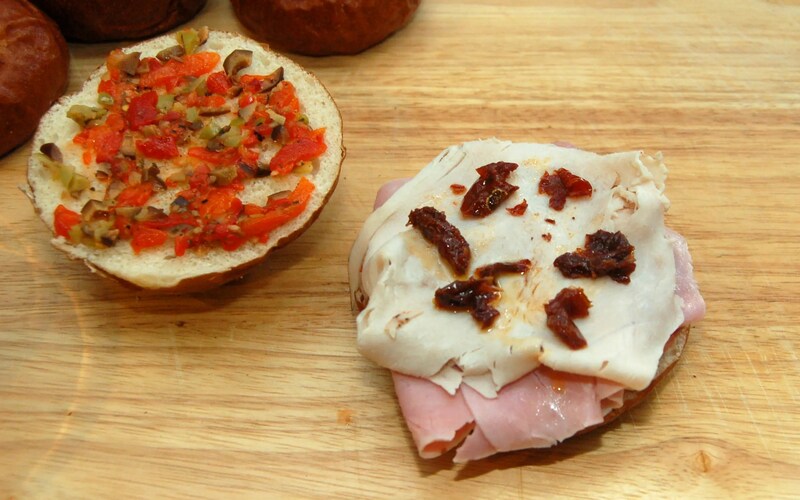 On the bottom bun add some finely chopped onion, then salami, ham, turkey, cheese, sundried tomato. Top with arugula. If not serving right away wrap tightly in plastic wrap and put in the refrigerator. They taste great even the second day. After adding the cheese, place under broiler until cheese is melted. 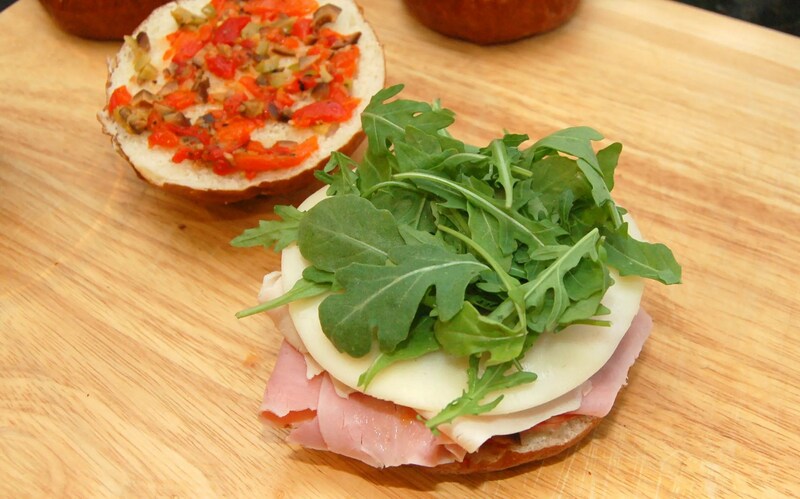 Top with sundried tomatoes and arugula and serve right away! How would I be able to resist eating them all?! I’m definitely trying this recipe. Thanks! You’ll have to come back and tell me how you liked it. It’s a good sandwich!